As discussed earlier, the Intrade probability of at least one nation exiting the Eurozone by the end of 2013 is now around 60%. In the past, many participants in the FX markets believed that Greece and other smaller periphery nations exiting the monetary union may be good for the euro. The idea is that the remaining economies would have stronger growth and lower overall credit risk. 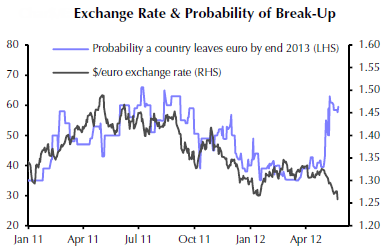 Because of this predominant view, the value of the euro roughly followed this probability of exit for some time. That assumption may be true over the long term, but the contagion risk associated with such an event is significant and the immediate costs to the Eurozone are enormous. Capital Economics: - Not only would it be uncharacteristic for currency markets to be quite so forward-looking, but even a limited euro-zone break-up which sees the exit of Greece and one or two other small countries would still have severe adverse economic and financial effects. And there would surely be, for a time at least, fears of a bigger break-up. Accordingly, it seems more likely that the markets have simply not taken break-up risks very seriously. The FX markets are finally taking breakup risks more seriously as the spike in exit probability coincided with a sharp correction in the EUR-USD FX rate as the two indices decoupled.